The practice of meditation didn’t gain popularity in the western world until the 1960s. Since then, however, numerous scientific studies have shown the massive benefits individuals obtain from a regular practice. One of these benefits is the positive effects meditation has on the aging process. Studies have shown a direct correlation between meditation and aging, proving the fact that a regular meditation practice can slow, and even reduce, humans biological age. In 1958, just one year after the release of the wildly popular book ‘On The Road,’ celebrated American author Jack Kerouac published a lesser known, but perhaps more culturally significant, title called ‘The Dharma Bums.’ Kerouac’s newly found celebrity, to go along with his interest in eastern religion, stoked American’s curiosity about meditation and the practice’s popularity has continually grown to this day. Numerous famous musicians who were inspired to start meditating after reading Kerouac’s work, such as The Beatles, also played a role in pioneering the mindfulness revolution that is currently taking place in the west. Up until the late 50s and early 60s, the benefits of meditation were largely a mystery to westerns, but today it should be considered a dynamic part of our cultural well-being. As the interest in meditation grew over the last 60 years, so to has the scientific research into the practice’s benefits. Over the past 10 years, a seemingly countless number of studies have shown the psychological, emotional, and physical benefits individuals receive from forming a regular practice. Psychologically and emotionally speaking, it is widely believed that meditation lowers individuals stress and anxiety levels, while increasing their levels of happiness. Physically speaking, meditators also see beneficial changes. Lower blood pressure levels, reduction in physical pain, and boosted immune systems have been regularly, and scientifically, proven to be the result of meditative practices. The practice of meditation is so life-affirming, in fact, that it is believed to slow, and even reverse, the aging process of human being. To gain an understanding of how meditation combats the aging process we can look at a number of studies that verify this truth, but it is first necessarily to gain an understanding of how the human body ages in different ways. To measure the age reducing effects that meditation provides individuals, who regularly practice, we need to evaluate the human aging process in two ways. The first, chronological age, is the age we are all familiar with and is reflective of the time that has past since our birth. individual’s biological age tells how their cells, tissue, and organs have progressed throughout their chronological life. To measure an individuals biological age, scientists can look at a number of biological components found in all humans. One way that biological age can be determined is to look at the caps found at the end of DNA strands, which protect our chromosomes, called telomeres. Similar to a cap that is found at the end of a shoelace, telomeres protect our DNA from becoming worn and damaged. Beyond the measurement of telomeres, other key scientific testing models can show how an individual’s biological age differs from their ‘actual age.’ Testing biological functions such as hearing, vision, and blood pressure can help give an approximation of an individual’s biological age because these mechanisms deteriorate steadily overtime and can be measured against a variety of live stages and age groups. While our societies are primarily concerned with the chronological age of individuals, the biological age is certainly a better measure of health and well-being. Advancements in scientific testing methods and a new found interest into studying the health benefits of meditation have made one thing clear: Meditation positively alters the biological age of practitioners. In 1982, psychologist RK Wallace pioneered the scientific study of meditation when he released results from a case study that showed a direct correlation between biological age reduction and meditation. Today, newer studies continue to show the positive and age-reducing benefits that individuals receive from a regular practice. We will first look at Wallace’s study, before moving onto more recent work, conducted by Noble Prize winner Elizabeth Blackburn, that highlights the correlation between telomeres, meditation, and the aging process. When RK Wallace set out to determine the connection between Transcendental Meditation (TM) and biological age, few, if any, studies had previously been conducted and significantly less was known about the aging of cells. To get an accurate read on individuals biological age, Wallace and his team looked at 3 distinctive biological components of individuals: auditory threshold, near-pointed vision, and systolic blood pressure levels. Wallace and his team examined 84 individuals to determine the affects that TM has on biological age. The study consisted of 3 groups: 1.) Non-meditatiors, 2.) Short-term meditators (0-5 years experience), 3.) Long-term meditators (5+ years of experience). The results indicated that short-term meditators had a biological age that averaged 5 years fewer in compassion to similarly aged non-meditators, and longterm meditations had a average biological age reduction of 12 years compared to non-meditators. It is important to note that these results did not take external changes, such as hair thickness or skin damage, into consideration. Wallace’s work in 1982 has given way to new and exciting meditation studies, and one of the foremost leaders studying the health benefits of the practice is Noble Prize winner Elizabeth Blackburn, who won the prestigious award in 2009 for discovering the previously mentioned telomeres. Before we look at her work, it’s first important to gain additional understanding of the role telomeres play in the human aging process. Cell division is a commonly known aspect of human biology. Each and every time that our cells divide, the protective caps (telomeres) wear down and our cells ability to function effectively become hindered. When our telomeres become worn, we age faster and become more susceptible to disease. Blackburn and her team have determined that the safety of telomeres is largely controlled by the levels of an enzyme, found in each of us, called telomerase. The levels of telomerase in individuals can fluctuate overtime, which would indicate that at various times we may have telomerase levels that are more or less protective. A person with a younger biological age would have higher levels of telomerase and longer, more protected, telomeres. While the shortening of telomeres is a natural human process, studies have indicated that various factors such as stress, environment, and cognitive processes play a role in determining our levels of telomerase and ultimately the length of our telomeres. 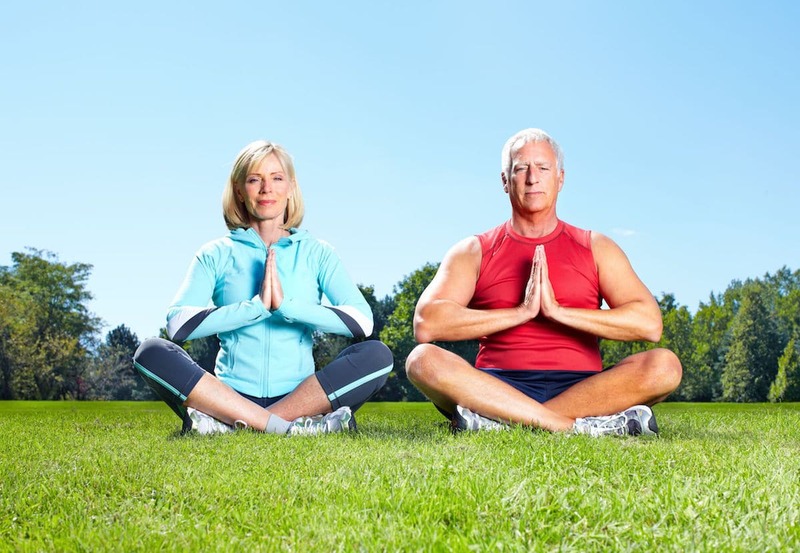 Blackburn’s team has conducted a number of different studies that show the positive effects meditation has on the telomerase levels of individuals, which results in a slowing of the aging process. In one of her most notable studies, Blackburn sent willing participants to a 3-month meditation retreat at The Shambhala Mountain Center in Colorado. After individuals completed the study, their telomerase were compared to a similar group of individuals who were on a waiting list for the course. The results indicated that the levels of telomerase in new meditators measured 30% higher than individuals who were on a waiting list for the course. In another study, telomerase levels were measured between two groups of dementia caregivers over an 8-week period. One group was taught an ancient meditation practice called Kirtan Kriya and the other group listened to relaxing music. Blackburn wasn’t surprised to learn that the group of meditating caregivers saw significantly higher telomerase activity in comparison to the control group who only listened to music. Studies similar to these will continue to show the positive health outcomes that meditators receive. By looking at biological aspects such as hearing, vision, blood pressure, and telomerase levels, it is easy to see how a regular meditation practice has the ability to slow, and potentially even reduce, your biological age. This is all obviously good news, but perhaps the best news of all is that the benefits you receive from meditation don’t stop here and can be seen across every area of life. If you are new to meditation, we invite you to read our article ‘Meditation 101,’ or visit our Meditation Archives for the latest articles about meditative practices.